The Mediterranean is a rich source of honeymoon inspiration. Yes, this is one of the world’s most well-trodden paths in terms of tourism, yet there are still hidden gems to be found and iconic places are constantly innovating. The Med excels in beaches, sparkling sea, culture, cuisine and classic five-star service, though this comes at a price in high profile areas such as the Cote d’Azur, as well as more rustic, authentic options. The major advantage of the Mediterranean is that it’s easily accessible and served well by both scheduled and budget airlines. Flight time from the UK can be under two hours. If you’ve had a hectic build up to your wedding, this can be a great advantage and there’s no jetlag either. It’s a great place for two or even three centre honeymoons, and a top spot for island hopping. France’s southern coast continues to be one of the most sought after destinations in the world – and rightly so for its natural beauty and cosmopolitan yet very French charm. The Cote D’Azur has been beguiling couples ever since Brigitte Bardot graced the town of St Tropez. Find more holidays in France. Italy is of course an iconic destination for romance. The Amalfi Coast is perfect for honeymooners with iconic towns like Sorrento to explore, craggy coves and delicious cuisine, not to mention incredible history, culture and natural sights from Pompeii to Mount Vesuvius. Classic Collection offers a fantastic range of honeymoon hotels on the Amalfi Coast. In the hills of Andalucia, the charming boutique DDG Retreat is a very special little hideaway with the choice of a romantic casa or tented suites with boho-chic interiors. It’s less than an hour’s drive from Malaga airport. Croatia and Montenegro are high on my honeymoon list. Technically speaking, this is the Adriatic which meets the Med, but this coastline is one of the great hotspots of Europe that is fast becoming a more affordable rival to France’s Cote D’Azur. Croatia is beloved of yachties who sail between the unspoilt islands, the stunning walled town of Dubrovnik and fashionable spots like Hvar Town with great four-star resort such as Hotel Podstine. On the Adriatic near Budva in Montenegro, a six-year renovation of a 15th fortified village on a tiny islet named Sveti Stefan, sees the opening of Aman Sveti Stefan Village with 50 rooms, cottages and suites amongst cobbled lanes, quaint courtyards and remarkable sea views, plus eight suites across the bay at Villa Milocer. Completely Croatia is a fabulous tour operator which has the low down on this region. Turkey has been climbing up the honeymoon hit list steadily as its hotels improve and the world wakes up to its authentic charms and value for money. It’s a four-hour flight with a reliably sunny year round climate, stunning coast and heritage to rival any Mediterranean destination. Turkey has a vast range of romantic places to stay from sophisticated five-stars such as the Kempinski Hotel Barbaros Bay to charming boutique hotels such as Mandarin Boutique Hotel in the unspoilt countryside just a short drive from the popular resorts of Fethiye and Oludeniz. On the Greek mainland, Halkidiki is a beautiful unspoilt region with fine sandy beaches. It’s home to Ikos Oceania and Ikos Olivia, sister hotels offering five-star all-inclusive honeymoons at great prices. Another option is to rent a big house for a wedding party then slope off for a little time alone. Check out this collection of wedding venues which includes chateaus in France and classical villas in Italy. The Greek Islands take some beating when it comes to honeymoons. Easy to get to and yet exotic, laid back and yet exciting, there’s an island for every kind of couple. 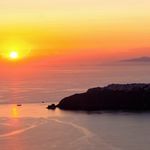 For sophisticated nightlife go to Mykonos, and for stunning views and boutique hotels I recommend Santorini. For a secluded hideaway in the Greek Islands, see the collection of boutique hotels at i-escape.com. 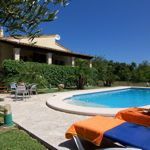 You can also rent a villa for two in Greece, with top picks including the Spiridon Beach House on Corfu and Villa Paionia on Lefkas. 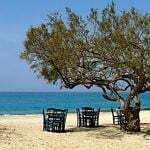 Cyprus is a long way south, on the same latitude as North Africa, so it has a particularly long season and excels in spring and autumn. See these special deals at luxury hotels. I personally love the Balearic Islands (Mallorca, Minorca, Ibiza and Formentera). Although they all have their own distinct character, they share modern design with a chilled-out vibe. Most exciting is Ibiza where you can avoid the package tour groups and stay at a romantic finca in the countryside, a boho agriturismo or this hip retreat which has a Balinese spa and chill-out zone with day beds and DJs. 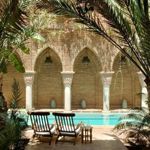 Mallorca is another perfect honeymoon island with superb restaurants and unspoilt villages – I recommend Vintage Travel if you want to rent a private villa for two. The Italian islands are hard to beat for romance. 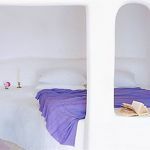 Sardinia is closer to Africa than Italy and a tried and tested honeymoon spot with all singing all dancing resorts like Forte Village to contemporary boutique hideaways such as Coluccia Hotel and Beach Club. We recommend Sardatur Holidays. The largest island in the Med, Sicily combines rugged countryside with idyllic beaches and Byzantine and Baroque antiquities. It’s great to explore by car and the shadow of Mount Etna – an active volcano – adds more drama. Best hotels for honeymooners include include The Ashbee and the Alba Palace Hotel. For all-out luxury, check out Sir Rocco Forte’s Verdura Resort. The French island of Corsica has some of the silkiest white sand beaches in the Med, along with mountain ranges, medieval towns and superb food. There are hotels, villas and apartments so you can opt for self-catering, or the full five-star treatment. 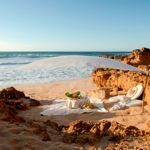 Best hotels for honeymooners include the U Capu Bianca overlooking the Gulf of Santa Manza. And of course if you fancy exploring multiple islands, a great solution is a honeymoon cruise. Although there are many ships plying the Med over the summer months, I would steer clear of the huge floating hotels which lack intimacy. The better options are the luxury ships where the focus is on high levels of food, service and comfort. For old school romance, try Star Clippers which operates a small fleet of tall sailing ships. Itineraries include the Greek Islands, the turquoise waters off Turkey’s coastline, mini moons along the Riviera Coast and cruises to Italy, Corsica, Sicily, Montenegro and Croatia. As these ships are much smaller and more intimate than mega liners, they are able to drop anchor in picturesque bays and harbours. Honeymooners might not readily think of North Africa when they’re considering the Med, but of course it’s home to one of the most spectacular coast lines in the world. It’s also good for spring and autumn honeymoons if you want sunshine but you don’t want to go long haul. Egypt is such as well-known yet often overlooked honeymoon destination. At present it’s super affordable and has all its wonders intact, from the pyramids to the ancient tombs. There are sublime places to stay and feluccas to sail down the Nile. Find more ideas on our homepage.